A best-value two-centre holiday among fishing villages and vineyards. Walking holidays Cinque Terre offers wonderful scenery along one of the most beautiful coastlines in the world. The villages of the Cinque Terre give us a glimpse at a way of life in a wild and wonderful setting with magnificent views. This is a moderately easy tour that uses the extensive footpath and mulepath network to take you from village to village, between forests and vineyards, through a spectacular terraced landscape overlooking the sea. You have also the time to visit the historic medieval towns of Levanto and Portovenere with their broad beaches and of course the five charming villages of Monterosso, Vernazza, Corniglia, Manarola and Riomaggiore, which make up the ‘Cinque Terre’; little gems of colourful houses in a green landscape. For over a thousand years people have lived in this dramatic landscape, slowly altering its features and cultivating the steep hillsides that lead down to rocky shores. There is more – the nearby Portofino Peninsula, the abbey of San Fruttuoso, and Camogli. £599 per person £250 single supplement (6 nights/7 days). Supplement of £50 per person over Easter and the high season months of July and August. £775 with 2 extra nights in Camogli, £279 single supplement. Includes 6 nights B and B, route notes/maps, local back up. Luggage transfers are NOT included but the excellent local train service means that it is easy to transfer your bags yourself. Transportation to/from the start/finish of the holiday. Luggage transportation. Any boat/train tickets. Lunches/dinners, drinks, personal expenses. Throughout the year except January. Please ask for prices in December. Day 1: Arrival in Levanto. If you have time visit the town centre, and maybe take a swim to wash off the tiredness of the journey. 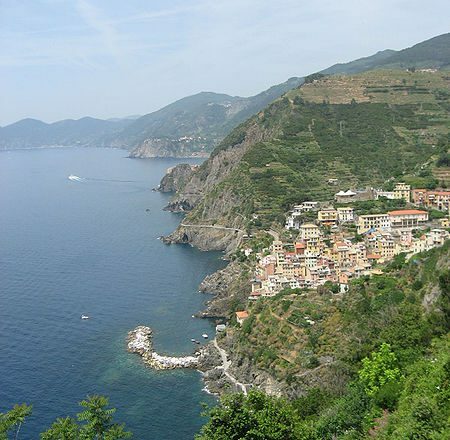 The first days walk takes you along the coast to Monterosso al Mare. Walk up towards Punta Mesco, the most notable promontory in the region and a good spot for a picnic. A small detour is possible to the ruins of an 11th century hermitage, from where there are marvellous views of the rugged coastline. Then follow a fairly steep path down into Monterosso, with traditional houses clustering around the beach. Time to explore the town before taking the train back to Levanto. (There is also the option of walking back following a more inland forested path). From Levanto you walk westward towards the small town of Framura (with the option to continue to Deiva Marina and Moneglia). Walk from the beach into the hills, via several charming little villages, where you have the time to drink a coffee or just relax. From any village en route you can take the train back to Levanto, in case you want to shorten the walk. Total walking time: around 3,5 – 6 hours (various options). You first take the train to Riomaggiore, the most southerly of the five villages, from where you start the walk along the famous ‘Sentiero del’Amore’ (‘Lover’s Walk’) to Manarola, an attractive little village with steep multi-coloured houses overlooking a rocky port. Then up the 365 steps to Corniglia, perched on a ridge overlooking the sea. Continue through terraced vineyards and the occasional citrus groves. As you approach Vernazza, arguably the prettiest of all the villages, dominated by its old fortress, you enjoy some of the best views in the region. Relax in a café or bar before returning by train. Today walk inland to the churches of Madonna di Reggio and Madonna di Saviore. Take the train to Vernazza and walk along the coast to Monterosso. Perhaps a coffee before climbing to the sanctuary of Madonna di Saviore and on to that of Madonna di Reggio. Continue more or less along the contour lines to the little church of San Bernardo, with beautiful views, and descend to the coast at Vernazza. A shorter option takes you directly from Madonna di Reggio, along a number of little chapels, back down to Vernazza and so to Riomaggiore. From Riomaggiore, you take a long flight of stairs to the Santuario della Madonna di Montenero. Continue along the cliffs, through terraced vineyards, enjoying wonderful views of the coastline. You are now on the ‘Sentiero Rosso’, the ridge-top pass leading from one end of the Cinque Terre to the other. Pass through the little hamlet of Campiglia, perhaps pausing for refreshment. Walking down into the pine forest, the track narrows as you continue towards Portovenere with further spectacular views. Arriving at the 16th century castle above the village, you may be able to see the distant peaks of the Alpi Apuane before descending. Visit the charming village before returning to Riomaggiore by boat. Optional Extension: If extending the holiday, take the train to Camogli. Then you walk on the Peninsula of Portofino, towards the beautifully located monastery of San Fruttuoso, dating back to the 11th century and set in its own cove and reachable only by boat or on foot. The walk passes through woods, beside the church of San Rocco and a number of impressive viewpoints. From San Fruttuoso there is the possibility to walk back or take the boat. In the afternoon take time to explore Camogli itself. Transfer by train to Santa Margherita, then walk to Portofino along a resort for the jet set, but also a very colourful village, with a castle and lighthouse; a spectacular viewpoint. If energy permits, you can continue along the trail, with splendid views across the Gulf of Genoa to the Abbey of San Fruttuoso, approaching it from the other side. You can choose to return by boat to Santa Margherita, or directly to Camogli. Day 9: End of the tour.